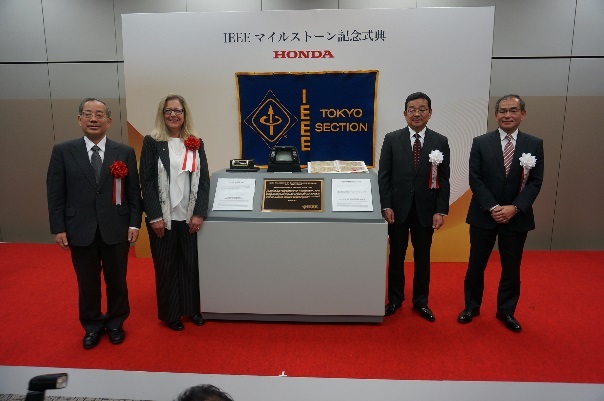 Dedication ceremony of IEEE Milestone for “Map-Based Automotive Navigation System” was held in the hall on the second floor of Honda Aoyama Building, Honda Motor Co., Ltd., Japan on March 2nd, 2017. 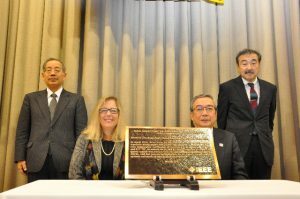 Ms. Karen Bartleson, IEEE President & CEO, presented a commemorative plaque to Takahiro Hachigo, President of Honda Motor Co., Ltd. The world’s first map-based automotive navigation system, ‘Honda Electro Gyrocator’, was released in 1981. This system was based on inertial navigation technology using mileage and gyro sensors. 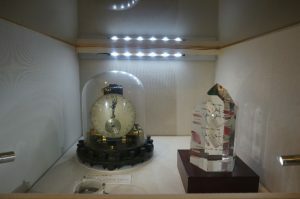 It pioneered the display on board of the destination path of a moving vehicle on overlaying transparent road-map sheets, and contributed to the advancement of automotive navigation systems. 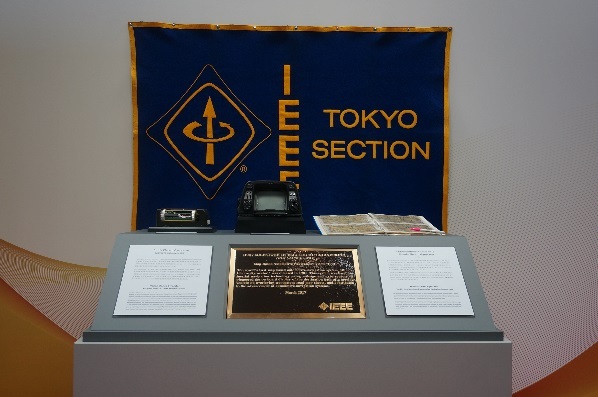 After the dedication ceremony and commemorative reception, IEEE milestone commemorative lectures hosted by IEEE Tokyo Section was held with about 80 participants. Three lectures of the following have been held. 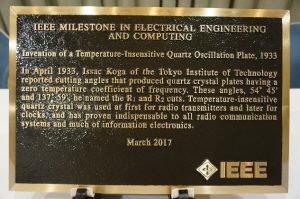 Tatsuya Kyomitsu, General Manager of Honda R&D Co. Ltd.
Dedication ceremony of IEEE Milestone for “Invention of a Temperature-Insensitive Quartz Oscillation Plate” was held in the hall on the Ferrite Memorial Room of the Centennial Hall in the Tokyo Institute of Technology, Japan on March 6th, 2017. Ms. Karen Bartleson, IEEE President & CEO, presented a commemorative plaque to Yoshinao Mishima, Tokyo Institute of Technology President. 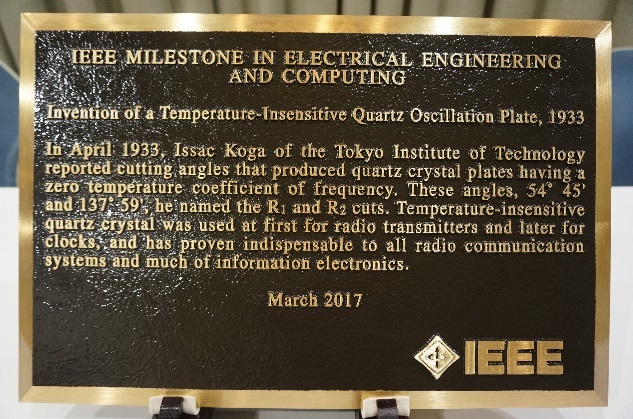 In April 1933, Issac Koga of the Tokyo Institute of Technology reported cutting angles that produced quartz crystal plates having a zero temperature coefficient of frequency. These angles, 54⁰ 45’ and 137⁰ 59’, he named the R1 and R2 cuts. Temperature-insensitive quartz crystal was used at first for radio transmitters and later for clocks, and has proven indispensable to all radio communication systems and much of information electronics. After the dedication ceremony and commemorative reception, IEEE milestone commemorative lecture hosted by IEEE Tokyo Section was held with about 190 participants. Five lectures of the following have been held.